Digital UltraViolet and Digital Copy will makes it possible for you to stream the movie The Mule HD VUDU or iTunes Code instantly to your computer and compatible Smartphones, Andriod, iphone, iPod Touch, iPad and tablets devices anytime, anywhere. 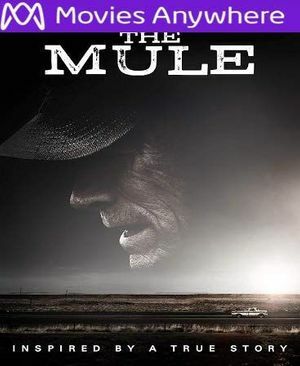 You can also download a Digital UltraViolet Copy or a Digital Copy of the movie The Mule HD VUDU or iTunes Code to your computer and compatible devices. M.A. Kleen 5.0 out of 5 stars Best Film of 2018? When 90-year-old Earl Stone loses everything he loves, can he use ill-gotten gains to win it back before the DEA, or the cartel, takes him down? Written by Nick Schenk and directed by and starring Clint Eastwood, The Mule (2018) was inspired by a New York Times article �The Sinaloa Cartel�s 90-Year Old Drug Mule� by Sam Dolnick. The Mule uses true events to frame a much more compelling story. Bucking the current trend of emotionally monochrome dramas, this film is a rich tapestry of triumph and tragedy, humor and sadness, and guilt and forgiveness. Earl Stone (Clint Eastwood) is a successful horticulturalist in Peoria, Illinois but neglectful of his family. He finds himself estranged from his wife Mary (Dianne Wiest) and daughter Iris (Alison Eastwood), but is still admired by his granddaughter Ginny (Taissa Farmiga). Mary and he divorce, and after failing to embrace the digital age, Stone�s business falls on hard times. He takes a mysterious offer to deliver a package from Mexico to Chicago. With his newfound income, he rebuilds the local VFW after a fire and helps pay for his granddaughter�s cosmetology tuition. Meanwhile, he frustrates his cartel handler, Julio (Ignacio Serricchio) with his unpredictable behavior. Things get complicated when DEA agent Colin Bates (Bradley Cooper) and his partner Trevino (Michael Pe�a) flip a cartel employee and he tips them off about a successful drug mule known as �Tata�, or grandfather. The unassuming elderly white man with a clean record was able to slip under law enforcement�s radar. At 90 years of age and with the DEA on his tail, Earl Stone is running out of time to reverse his fortunes and reconcile with his family. Most of the events depicting Earl Stone�s family life were not based on his historic counterpart. Sharp had a wife and three children, and was still married when he died. The filmmakers changed the years in which the events took place, and changed Sharp�s home state from Michigan to Illinois. These changes, particularly when it comes to the main character�s personal life, substantially improved the story and added much-needed depth, drama, and substance. The filmmakers didn�t set out to tell Leo Sharp�s story; they used it as a springboard to tell their own. It�s difficult not to compare The Mule with Clint Eastwood�s 2008 film Gran Torino. We don�t see many elderly protagonists on screen anymore, and Eastwood seems to have carved a new niche for himself late in his career. Like the character of Walt Kowalski, Leo Sharp is an emotionally reserved and politically-incorrect elderly white man having a difficult time adjusting to the modern world. Both are Korean War veterans, and both experience the loss of a spouse. While Kowalski sacrifices himself to remove a threat to his community, Sharp embraces a life of crime to improve his financial situation and help others in need. Sharp is no hero, but he learns the importance of placing family before his own ambition, finds forgiveness, and rekindles his relationship with his family. The Mule�s message is deeply personal, and therefore is the more emotionally impactful of the two films. The Mule opened to generally favorable reviews from critics and audiences alike. Cynical viewers might dismiss parts of this film as overly sentimental, but you�d have to have a heart of stone not to be moved by some aspect of the story. It has a 60% rating from critics and 72% audience favorability on RottenTomatoes, and pulled in $17.5 million in its opening weekend (finishing second at the box office). With what might be his last film, 88-year-old Clint Eastwood cements his place as one of the greatest actors and directors of our time.